In between DDR, organizing Aniwave, jobs, and superfluous things like eating and sleeping, I have somehow managed to read a bit of manga. My latest interest has been Q-Ko-Chan. It's a two volume manga with a very unique art style and thoroughly confusing storyline. 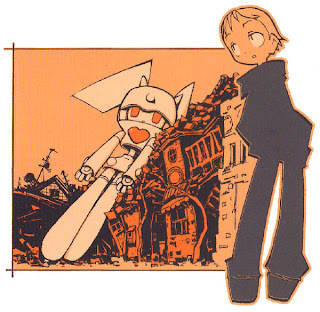 Q-Ko-Chan comes to us from acclaimed artist Ueda Hajime, who previously brought us the wonderful FLCL manga. True to his own artistic sensibilities, Ueda has created an original concept with all new characters and designs. Yet some similarities to FLCL are still evident with it all revolving around giant robot battles. Much as FLCL was not really about robots, so too Q-Ko-Chan focuses on the relationships between its characters. Being such a visual person, I am most fond of Ueda's art. The plot and writing of the manga is not perfect to be sure. In fact, I intend on reading it again, now that I understand a thing or two about what's going on. Because the first time trough, especially in the first volume, very few things actually made sense. When it comes to the art, however, I was very pleased with it from the start. One of Ueda's stylistic choices that particularly appeals to me is his sparse use of lines. At times his faces and characters are drawn so minimally that certain features are simply left out. There has been some criticism of this style as a result, though not from me. I find that it is simply beautiful how Ueda can convey the meaning of a cell with so few elements. This, perhaps more than anything else, demonstrates to me his aptitude for design in manga. When it comes down to it, if you are more artistically inclined in your enjoyment of manga, then you would probably benefit more from this review [via Read About Comics]. On the other hand, if story is just as important to you, if not more so, then I might suggest the blasé review [via Prospero's Manga]. Let's face it. Whatever your take, it's hard to find a robot much more kawaii than Q-Ko-Chan!